GetResponse Vs Mailigen: Which is the better email marketing service? If your business has any online presence at all, then email marketing is a vital aspect for the same. No matter what is the size or nature of your company, without a valid email marketing service, you simply cannot hope to become successful. But finding the best email marketing service(one that’ll be feature-rich as well as reasonably priced) is not an easy task to do. Thus, in this post, we are reviewing two leading email marketing services GetResponse Vs Mailigen to help you track down on the best one. We have reviewed both the services on the basis of their features and price, so let's begin. Email Creator: GetResponse offers an amazingly simple email creator. There more than 500 email templates on offer that you can use to create your customise newsletter. The editing interface, featuring drag and drop editing technique is neat and clean. There are more than 1000 images too that you can use to customise your newsletters. This simple designing tool is entirely suitable for any novice marketer. However, if you want to build your exclusive newsletter from the scratch, you can do so with HTML coding option. When you are finished designing your amazing emails, you can pre-schedule them to be delivered at your preferred timing. Landing Page Creator: We found this feature pretty impressive. Generally, you have to purchase a separate software for creating your landing pages. But with GetResponse you get one of the best landing page creators in the market for absolutely no added cost. The Landing Page creator is as simple as the email creater and features the same editing techniques. You can use over 100 free templates provided by them to create your landing pages. Autoresponders: The Autoresponders 2.0 is a very powerful feature offered by GetResponse. With the help of this feature, you’ll be able to deliver tailor made content to your subscribers based on their interest, at pre-scheduled times. Webinar support: Well, this is pretty cool! You can embed your webinar links in your emails. Make your customers sign up for a webinar, let them access the webinar or give a timely reminder about it; the webinar feature is sure to increase communication and involvement with your customers. Well, I don’t think it can get better than this. The basic plan starts at only $15 a month. So, even if you are a small business or an individual blogger, you can afford it quite easily. There four plans in total, so you can choose one according to your business size. Email Creator: The email creator is pretty easy to handle. The software provides you with some templates to work on. However, the templates are fully designed, and you’ll have to put designing elements for them to look like your newsletters. The editing tool is drag and drop so that you won’t face many issues doing that. Autoresponders: The Autoresponder here works amazingly, sending follow up emails, personalised emails, etc. Online Survey: This is a valuable feature offered by Mailigen. Through this function, you can send survey questionnaires to your subscribers to get their feedback on any particular campaign, product or policy. Mobile Marketing: This is a quite handy feature that lets you integrate your email campaign with the mobile campaign as well. You can see the Mailigen pricing plans above. The cost is reasonable, and there are six plans to choose from. So, you get much flexibility too. GetResponse Vs Mailigen: Who Wins? 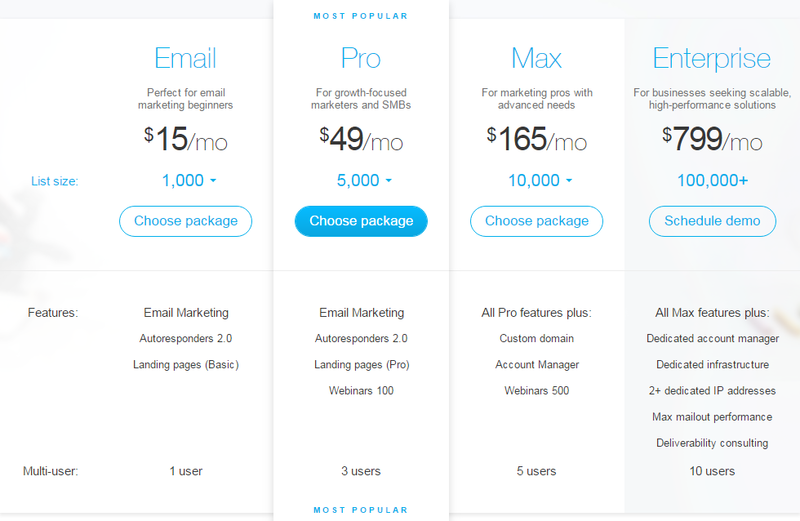 Well, Mailigen have some great features, and the pricing is too. However, when considered overall, we would go for GetResponse only. Why? The email templates are great. I created my first email in 2-3 minutes. You get a full-fledged Landing Page Creator for free. With Mailigen, you’ll have to purchase it separately. This means you actually save a lot of money with GetResponse. The Autoresponders 2.0 is advanced. The vast number of allowed integrations means I get more freedom in choosing any software or service. So, I am going ahead with GetResponse, what about you? Sign up for the GetResponse 30 days free trial and check out the awesome features yourself. Nice review. I've never heard about GetResponse, but I'll see how it works for me. Thanks!